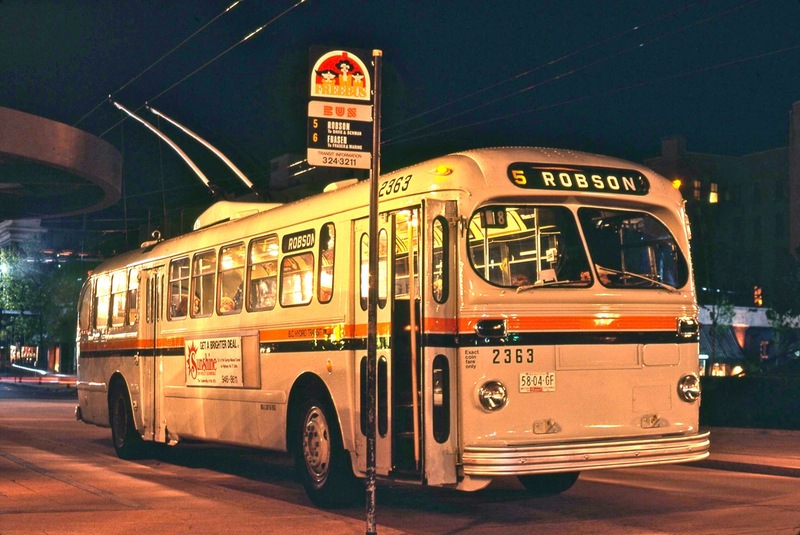 Hastings west of Main carried 109 buses per hour in 1975. I’m just… 109 buses per hour. 8400+ pphpd. I just don’t even. Other details here are pretty damn interesting. SeaBus originally planned at 8 minutes travel time (that’s, what, half the current!?). Gord – if I remember correctly, downtown bus service was free in 1977 when I first moved to Vancouver. Sort of shoppers transit. It was ended shortly thereafter. I believe our sister cities of downtown Seattle and downtown Portland still have this free service. Certianly they used to. I think a return to free downtown bus (not SkyTrain) service would help also address Councillor Meggs recent call for free transit for the homeless, at least the great bulk of whom reside in Vancouver where the majortiy of social services, housing and possible jobs are still located. Can you or anyone else confirm this “fact” to complement this interesting posting? The fareless downtown areas in Seattle and Portland were removed in the last couple years. Since 1975, rapid transit has eliminated almost all of the constraints on the design of the downtown network that resulted from the need to accommodate regional and even some local buses. These constraints were considerable. The capacity provided by adjacent parallel streets is no longer needed, specifically on Hastings and the Powell/Cordova couplet. There aren’t enough buses to justify the separation, and it makes for worse transit in the corridor. The connection to far-faster rapid transit service to downtown has eliminated any special need for the Main, Fraser, Kingsway, Commercial/Victoria, and Renfrew buses to go downtown. Nearly everyone transfers to SkyTrain. The one big thing that can improve transit downtown is separating buses from traffic. Fewer but more frequent routes can share separated lanes and stops downtown, even when they have dissimilar stopping patterns outside the downtown. Rapid transit has imposed new constraints on the design of the downtown network, though they aren’t so onerous. Basically, the buses have to connect to the stations as quickly and as directly as possible. Whether the Robson bus goes through Robson Square or straight to Burrard Station makes little to no difference to trip times connecting to the Expo and Canada Lines. The debate over buses through Robson Square should really be about whether it makes the square better. (1) on the volume of buses: yes it was fairly impressive (it was 109 buses/hr one way! )…this reminds us, that the traditional justification for trams/streetcar in Europe, or in Sydney, is to decongest streets from buses. (2) Yes, it was a fare free zone: the reason I have selected this picture of the bus 5, is that it highlights the “Shoppers Free” Bus sign. 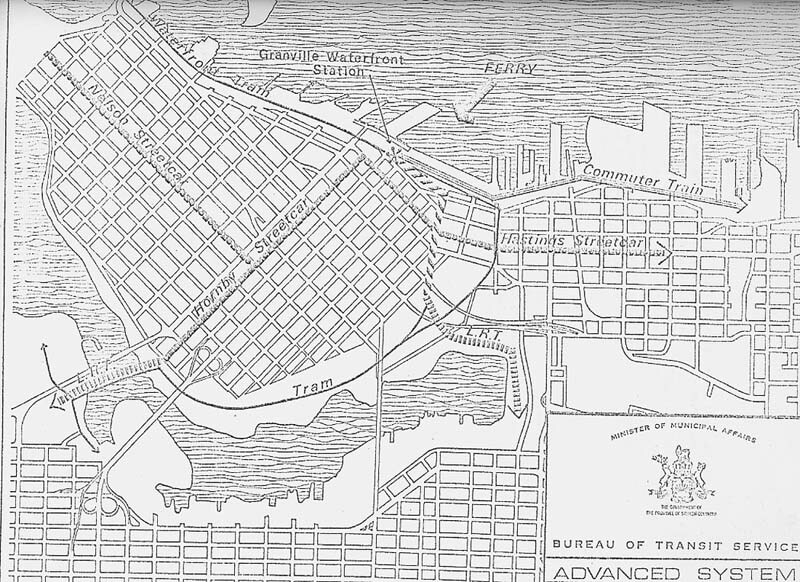 Vancouver never had a free downtown zone as Seattle did, but for a number of years starting in the mid-1960s there was the DOWNTOWNER pass, sold on buses in the downtown core only for 30 cents, when the fare was 20 cents. This permitted the pass holder to ride downtown buses freely and shop between 9:30 and 3:00, and it covered your ride home as well. It included all of the West End to Stanley Park. Many West End residents would buy the DOWNTOWNER in the morning for their downtown trip, use it to go home, say at noon, and leave it at the mailbox of their apartment building for another resident to use. The pass was not valid outside this area, so it the passenger had to transfer, say at Broadway, he/she could exchange the DOWNTOWNER for a transfer. The Shopper’s Free Bus essentially replaced the DOWNTOWNER, and used Brill diesel buses painted in a paint scheme to mimic the old B.C. Electric observation cars. There were some interesting innovative ideas floating around in those days. Keep in mind this was also at a time when everybody put a fare in the fare box, as there were no monthly passes. While fare evasion was virtually nil, people would still try and fudge their transfers.